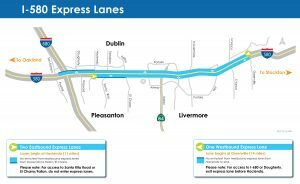 The I-580 Express Lanes span approximately 10 miles from Hacienda Drive in Pleasanton to Greenville Road in Livermore in the eastbound direction, and approximately 12 miles from Greenville Road to just before the I-680 overpass in Dublin in the westbound direction. How to use the I-580 Express Lanes? A FasTrak® toll tag is required for ALL I-580 Express Lane users. In order to travel toll-free on the I-580 Express Lane, carpoolers need to have a FasTrak Flex® toll tag set to 2 or 3+. Get a toll tag today. The I-580 Express Lanes operate Monday - Friday 5 a.m. - 8 p.m. Outside of these hours, the lanes are open to all vehicles at no charge. Who can travel in the I-580 Express Lanes? The overhead sign states the toll amount to travel to next zone (top line) and the price to travel to the end of the express lane (bottom line). Toll prices vary based on congestion and can change every 3 minutes. Customers are locked-in to a toll rate controlled by the overhead sign prior to the location of entry. The locked-in rate does not change if the price goes up or down while the customer is still in the express lane. If you exit prior to the last zone, you may be charged a toll between the price on the top line and price on the bottom line. Stay In The Lane – The Toll Stays The Same! A toll is assigned based on the first and last location at which the vehicle was detected. If you leave and then re-enter an express lane, FasTrak will charge you a single toll as though you travelled continuously in the lane. It is unlikely that weaving in and out of the express lane will decrease your toll. Carpoolers and those eligible to use carpool lanes (motorcycles, clean air vehicles with a white or green sticker) must have a FasTrak Flex (switchable) toll tag to use the lanes toll-free. It is the only way to travel toll-free in the express lane. FasTrak Flex has a switch that allows drivers to designate whether they are driving solo, or are a carpool with 2 or 3+ occupancy. Order your FasTrak Flex toll tag online now. Who Needs A Fastrak Toll Tag? Everyone using the I-580 Express lanes during operating hours (M-F 5am-8pm) must carry a valid toll tag properly mounted in the vehicle. If your flex tag is detected in different positions during your express lane trip, you will be charged based on the lowest occupancy that is detected. For example, switching the Flex tag setting from 1 to 2 after you have entered the express lane could still result in a toll charge for the entire distance traveled. We recommend checking the tag position before each time you travel in the express lane. Alameda CTC formed a partnership with the Federal Highway Administration (FHWA), California Department of Transportation (Caltrans) and the California Highway Patrol (CHP) to develop and implement the I-580 Express Lanes Project. Electronic toll system installation began Spring 2015 and the new express lanes opened in February 2016. See construction photographs from June 2015. For recent press releases, visit our Press Room. The westbound express lane begins at Greenville. There is open access to and from the lanes (providing easy access to/from local exits) from Greenville to Hacienda and no entry/exit from the lane from Hacienda to the end (just before San Ramon/Foothill). Please note: for access to I-680 or Dougherty, exit express lane before Hacienda. The eastbound express lanes begin at Hacienda. There is no entry/exit from the lanes between Hacienda and Fallon/El Charro. Please note: for access to Santa Rita Road or El Charro, do not enter the express lanes.